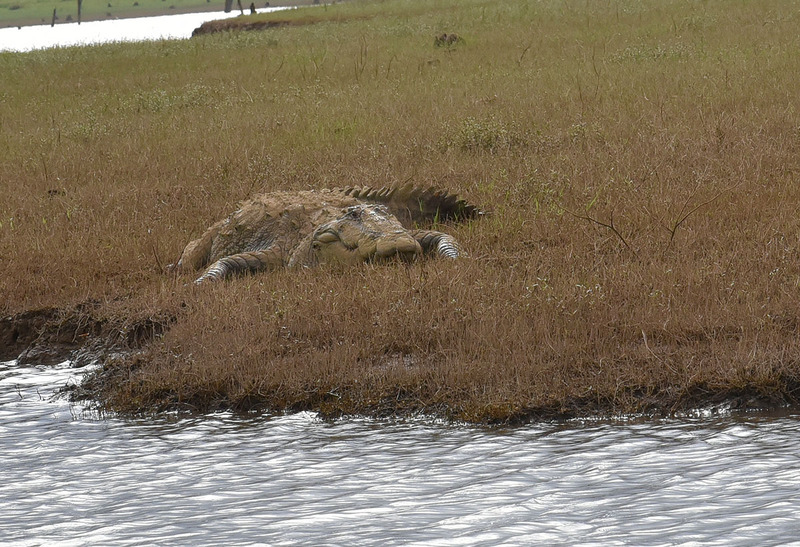 This is our first time in Kabini during the rains. Our two previous visits were deliberately planned around the dry period between February – April, when the parched land forces its wild denizens out into clearings around the river, almost guaranteeing big cat sightings. This time it is the jungle that is the hero, in its lush rain-washed splendour. That fresh earthy fragrance transporting me to the joyful monsoons and paper boats of a past life. 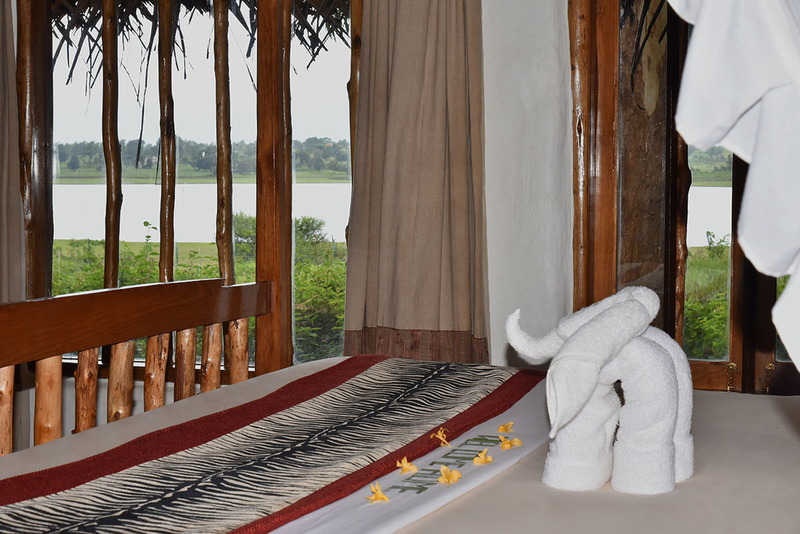 And I cannot imagine a better spot than the Evolve Back Kuruba Safari Lodge (formerly Orange County Kabini), from which to soak it all in. 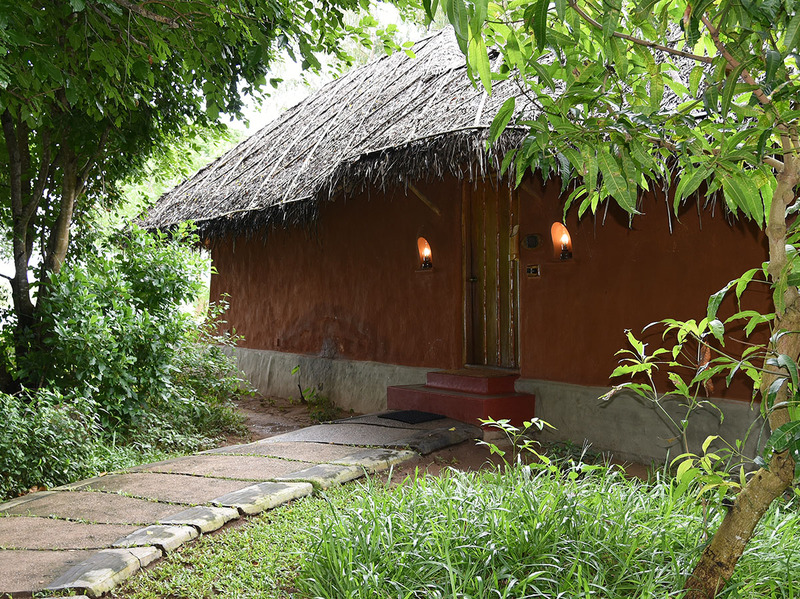 Inspired by the villages of the indigenous forest dwelling Kadu Kuruba (forest tribes) and celebrating its idyllic setting sandwiched between two national parks and on the banks of the forest fringed river Kabini, the safari lodge epitomises the ‘authentic localness’ that the Evolve Back/ Orange County brand aims to showcase in its properties. 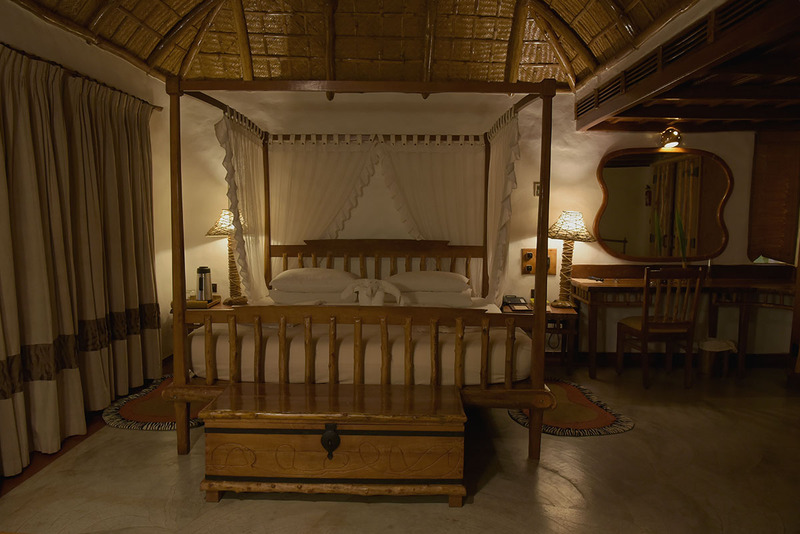 The accent is on rural rustic as opposed to the royal theme of their Hampi resort. Clay and ochre mud walls and thatched roofs blend seamlessly with the riverine landscape. Cement floors recreate the cured cow dung floors of tribal houses in colour and texture. All vertical supports are slender logs of wood. The ceiling is lined with wicker mats. Even the sliding wooden ‘bolts’ across doors are inspired by village woodwork. The rusticity, however, combines remarkably with thoughtful design and exceptional hospitality to match its sister resorts in modern comfort. A maze of rough stone paths connect two categories of residential units sheltered beneath a forest of native trees meticulously labelled for the budding botanist among guests. And neither of the two, the Pool Huts nor the Jacuzzi Huts, are ‘huts’! 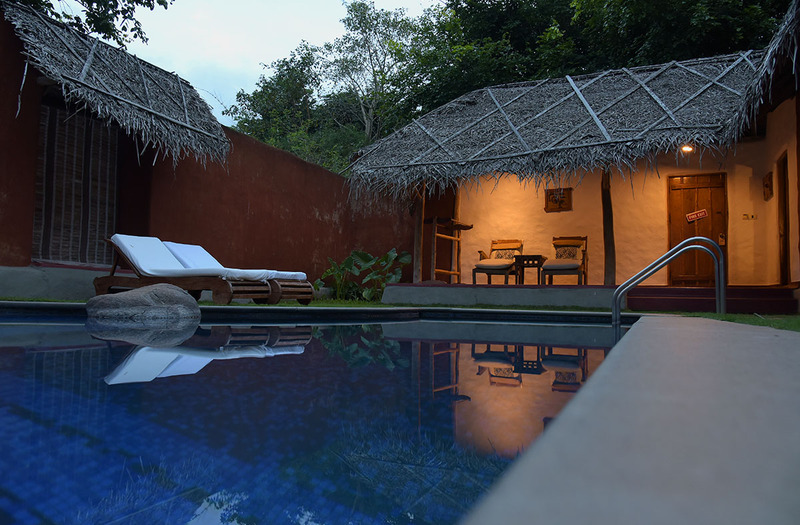 Ours opens into a spacious walled courtyard with a beautiful private plunge pool. A door leads into a large living /dining space with a terrace beyond, with expansive river views. To the right, is an enormous bedroom, also with windows facing the river. 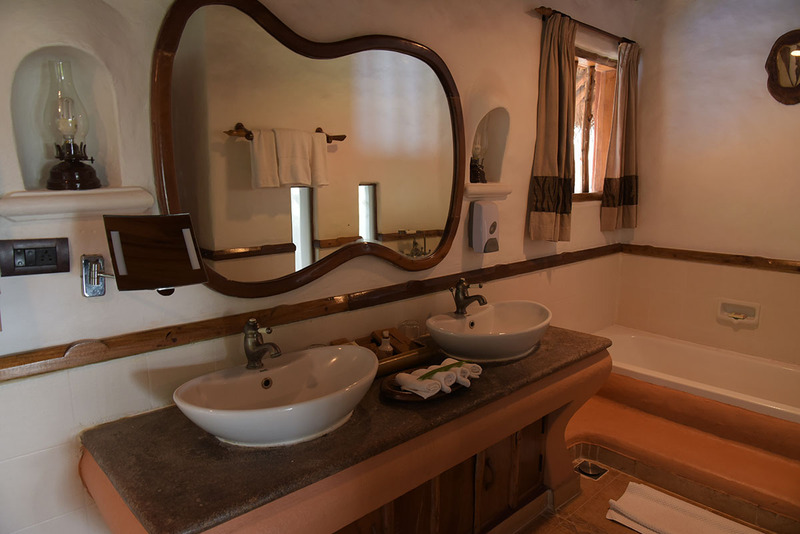 The long narrow bath has a tub as well as a standalone shower alongside a little landscaped space connecting it to the pool out front. I am delighted to spot Sidapur coffee sachets (from the owners plantations in Coorg) on the complimentary minibar, and a French press to brew it in. The TV strikes a discordant note (not many will agree!) but WIFI is limited to public spaces. The Jacuzzi Huts equipped with private, open to sky jacuzzis in place of the plunge pools, are marginally smaller and have no river views, but are no less luxurious. The slightly dated interiors (across the board), we learn, are due for a compete overhaul. The public areas all face the water. 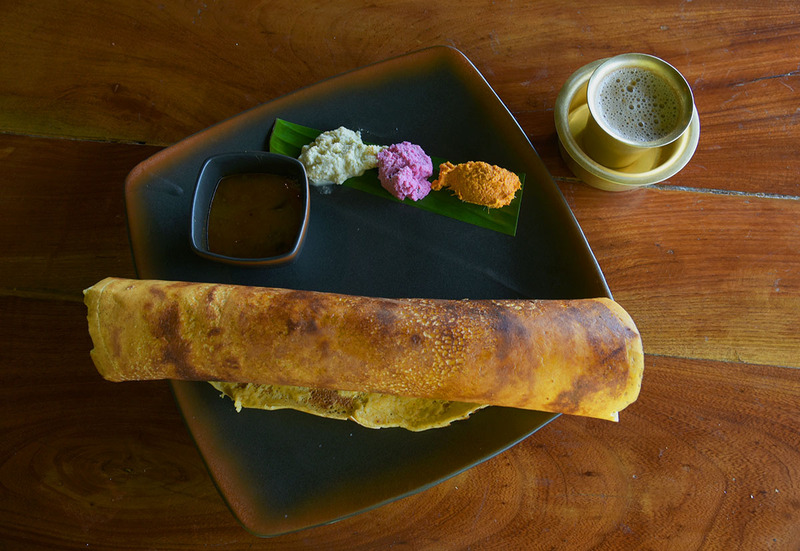 The Honey Comb (inspired again by the honey gathering Kuruba people) is the main dining space with a coveted verandah that boasts the best views. 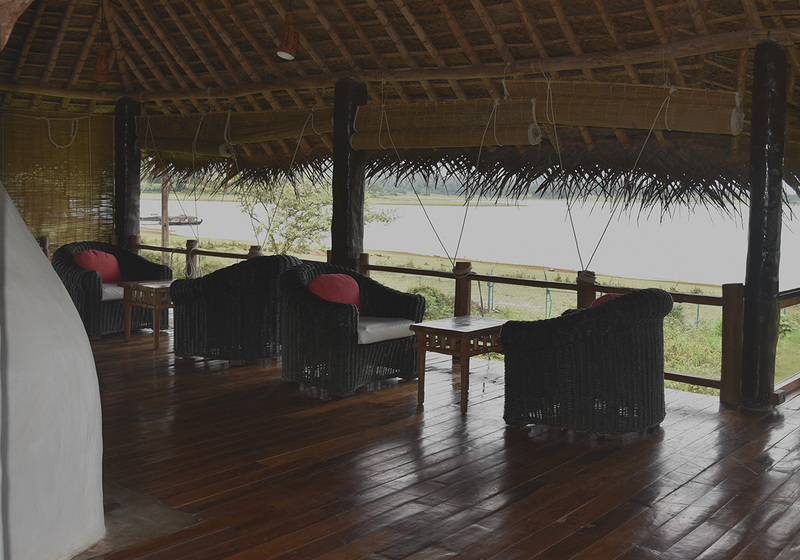 The smaller, a la carte restaurant, the Kuruba Grill, is in a lovely and more intimate enclosure by the river. A romantic dining option in good weather! The buffet system for all included meals while convenient, detracts a bit – for us – from the luxury vibe. (The rotating menu in the Kuruba grill nearly mirrored the buffet spread during our visit.). That said, everything on offer is beautifully cooked and delicious, especially an organic counter with native grains and vegetables based on authentic local recipes. 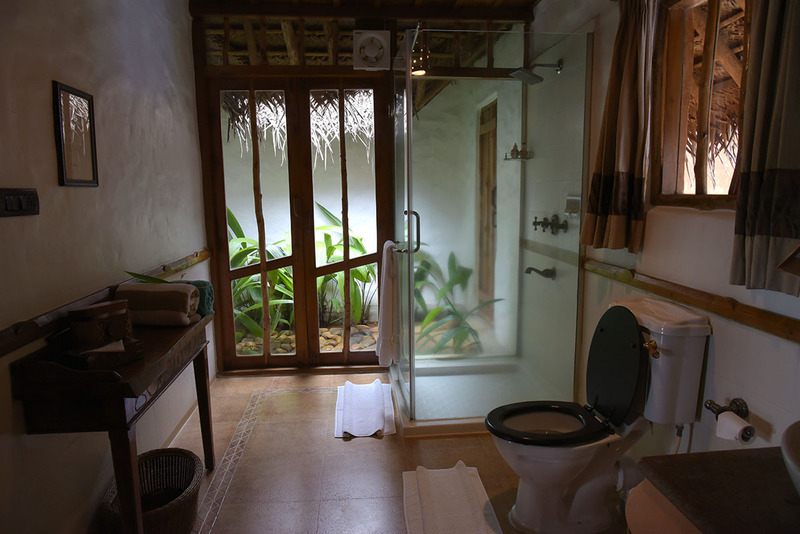 Other facilities include a meeting room, a fairly well stocked bar, an ubiquitous Ayurvedic spa overlooking a lily pond, an infinity pool for adults on the edge of the water and a family pool beside the pool lounge. A host of excellent community and conservation initiatives underscore the brand’s commitment to responsible tourism. Plastic is shunned. Solar power supply is zoned so as to shut off grids depending on occupancy. Drinking water is piped into each unit via a built in RO system, and waste water recycled. 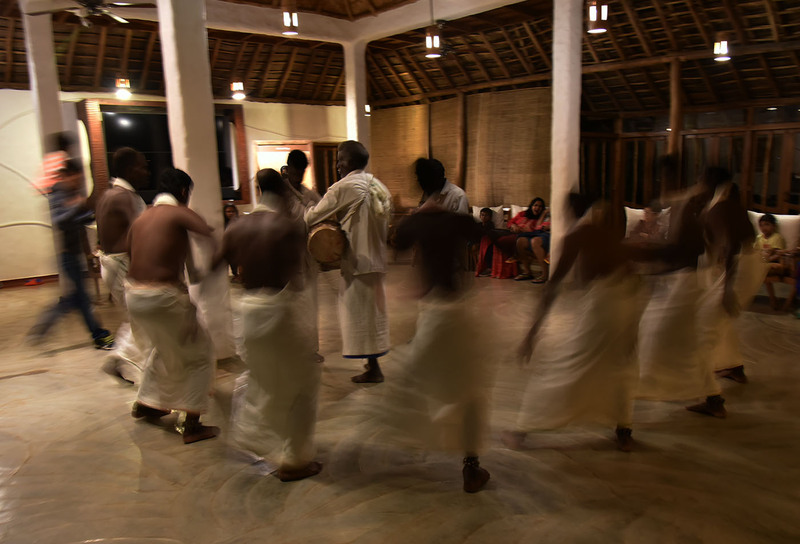 Kuruba folk song and dance performances every alternate evening are part of a commendable effort to incentivise younger Kurubas who have begun migrating to cities, to stay back and preserve their culture. There are plenty of activities designed to occupy guests willing to drag themselves out of their daybeds. Coracle rides, nature walks, wildlife documentaries, night trails. I am half grateful to the rain for saving me some effort, but I regret missing the nature walk and a Kuruba village visit that I had looked forward to. 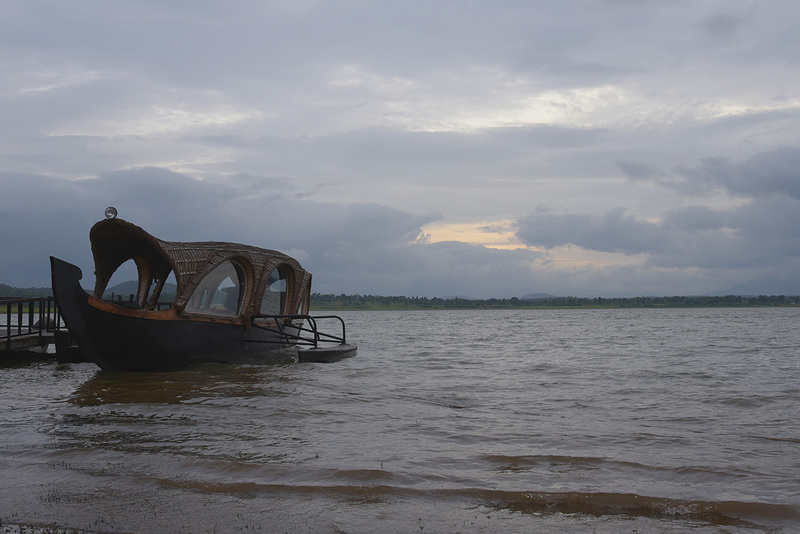 We do get to go on a boat safari and an overland safari on two consecutive evenings. 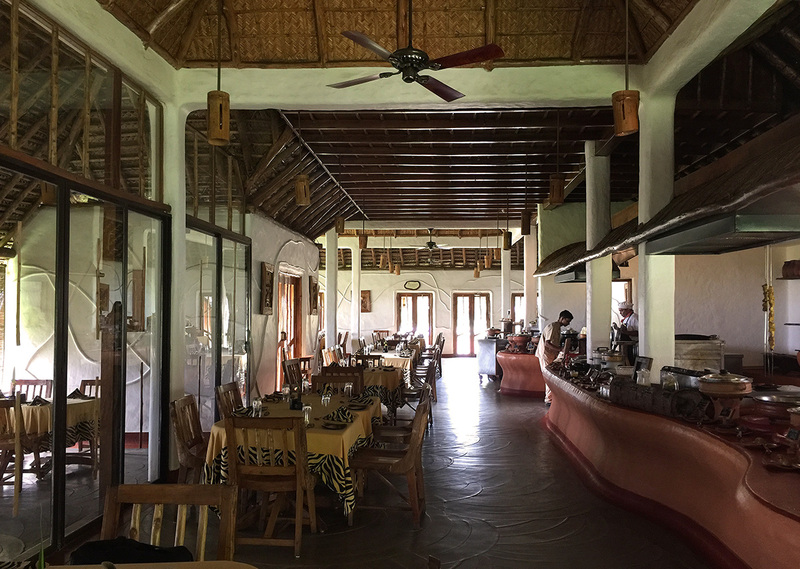 Safaris, routinely organised by the government run Jungle Lodges, are the only exclusions in the Evolve Back all inclusive rate and need to be pre-booked. 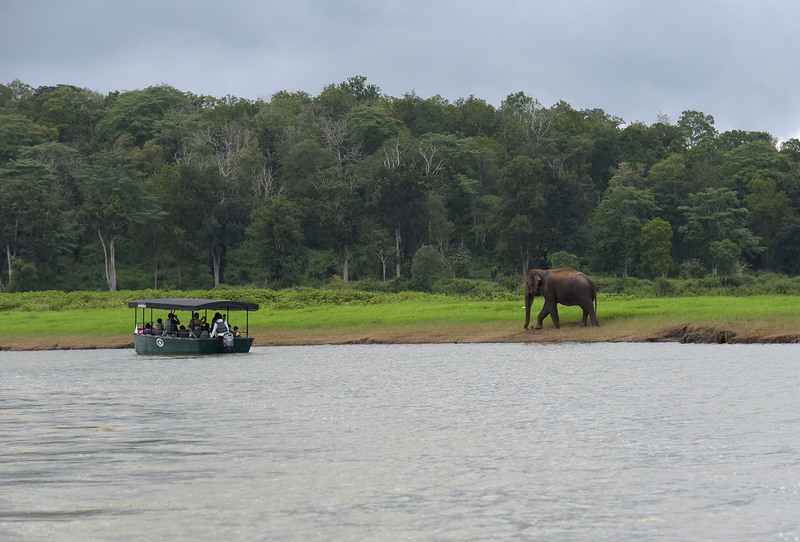 The upside of our location along the safari route is that the forest department boat picks us up from our pier. I have no expectation whatsoever, based on Ravi’s not very glowing account of a previous boat safari in the heat of summer. 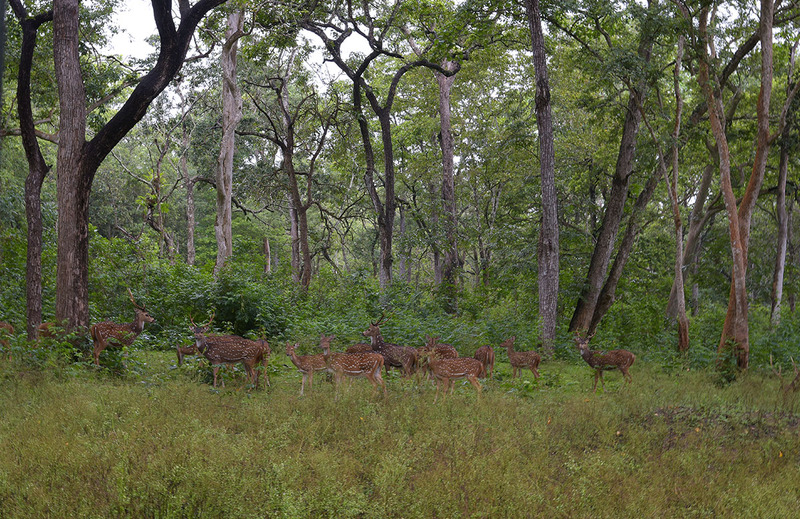 But monsoon clouds make for a cooler, rather atmospheric ride and we encounter more wildlife than we had hoped for. A very shy beast who doesn’t appreciate an audience. Ekadanta’s had enough of humans for one day. Lessons in sharing limited space…. The overland safari involves a ten minute boat transfer across to the Jungle Lodges where we are herded into our appointed forest department vehicles. It is a literal washout owing to continuously drippy weather and to the fact that we miss seeing a tiger sipping water off a puddle in the middle of the road, by a whisker. The deep green densenesss of the jungle is a pleasant contrast to the bare brown landscape of our previous visits however, and makes up for the elusive wildlife somewhat. Hot tea and snacks awaiting us in the Honeycomb is further consolation. Back at the lodge, we find sanctuary from the rain in the charming reading room on the edge of the property. 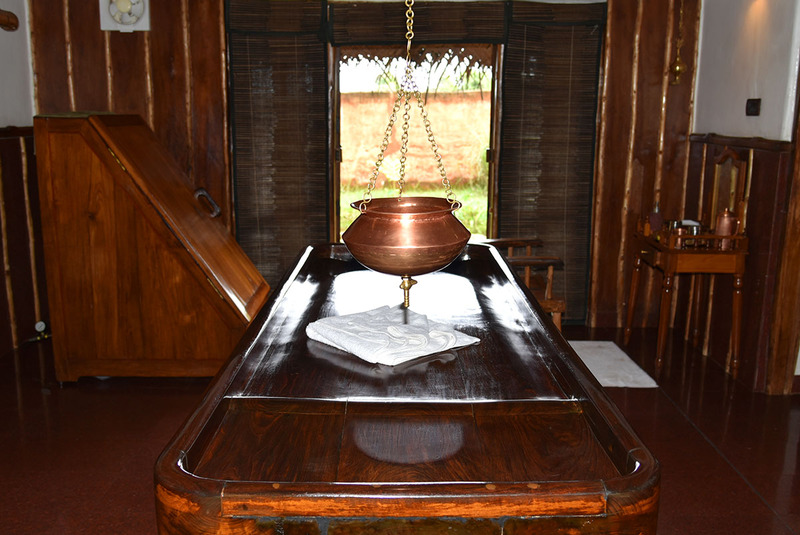 We spend most of our free time here, warmed by freshly brewed coffee and connecting to the chorus of Kabini. Red whiskered bulbuls alight on the log railings at frequent intervals. Wagtails bob around on the grass beneath. Flashes of electric blue dive bomb the river between rows of patiently motionless white herons. Peacocks screech in the distance. 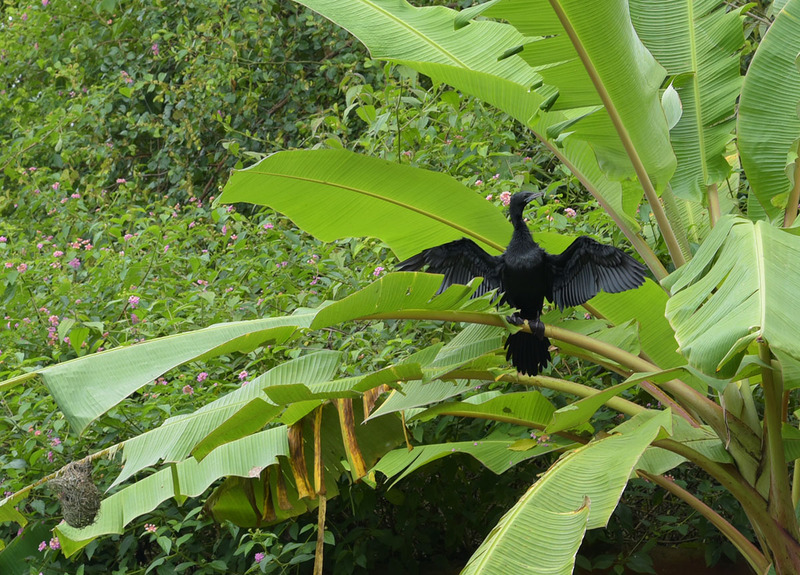 A cormorant darts up onto a tree and unfurls its wings to dry. And down below, a lone Kuruba man hums a doleful tune as he herds cattle towards his village further along the river. What else is a waterbird with non-waterproof plumage to do? Many thanks to Evolve Back Luxury Resorts for hosting us. All views and opinions are, as always, my own. Thank you very much Sisir. The light, sadly, was bad throughout our stay. Many similarities to an African safari from the accommodation to the animals. This seems like a lovely stay. Nice sightings. Yes surprisingly good sightings for the season! Thank you Niranjan. Oh wow, what a beautiful experience! I have never been on a safari before, but will go on my first one in December 2017. Wonderful! Our wildlife experiences – in Africa and here at home – rank among our most memorable. Where are you going? Oh that looks so enticing. Wish I was still able to travel abroad to see that for myself. How beautiful, I wish I could bee there with a snip of my fingers. Haha, wish all travel were that easy 🙂 The Evolve Back group is eyeing Africa. Will be interesting to see how that pans out. I’m not familiar with luxury, and therefore don’t contemplate its possibilities, but this post makes me yearn for it! You write so invitingly of every aspect, and your photos add to the seduction. Do I perhaps need to celebrate 75 thusly?! Thank you for another window on your exotic-to-me world. I bought a 2018 diary the other day and my son said “Bit optimistic aren’t you?” Encourages me to make 2019 plans! Thought you might like to know Christine’s Stuart is having an exhibition of paintings, starting yesterday, of the local river. Thank you for letting me know Meg. Shall surely take a look. 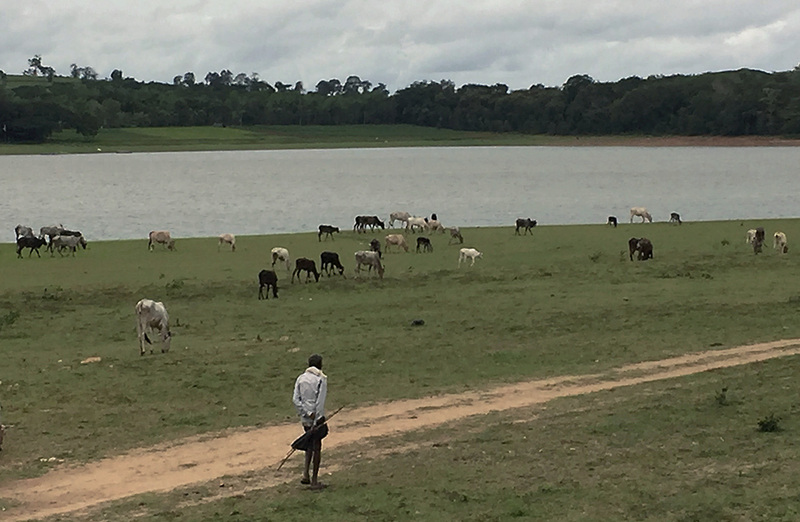 Beautiful photos and how great it would be to see nature in such perfect bliss with the surroundings…wonderful, and just reading this post makes me think I need to head out on a safari 🙂 Inspirational piece Madhu! The place is gorgeous and a perfect gateway to claim serenity. Of course, the photography capture life in its essence. It is indeed Vishal. Thank you very much for your lovely comment. Have a great weekend. How beautiful and enticing, Madhu! Thanks for sharing this wonderful experience! Thank you for reading Lauren. Hope you have a beautiful weekend. 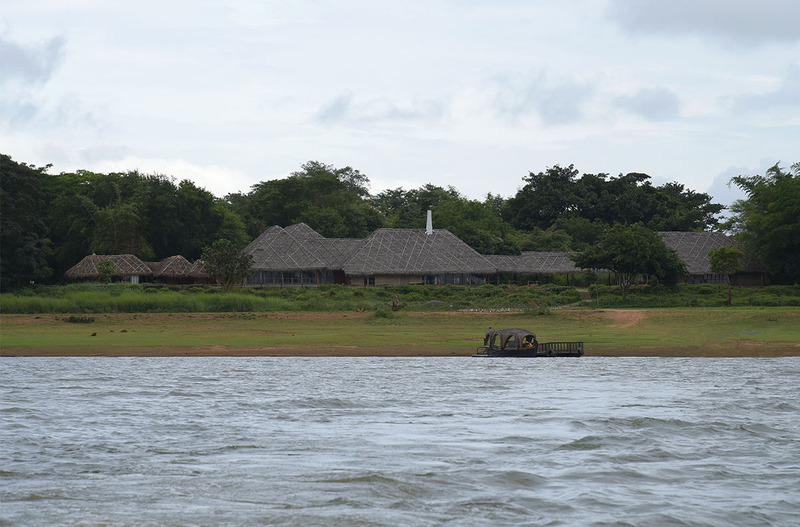 Kabini and this lodge are indeed wonderful. 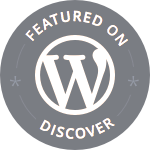 Thank you for reading Palani. 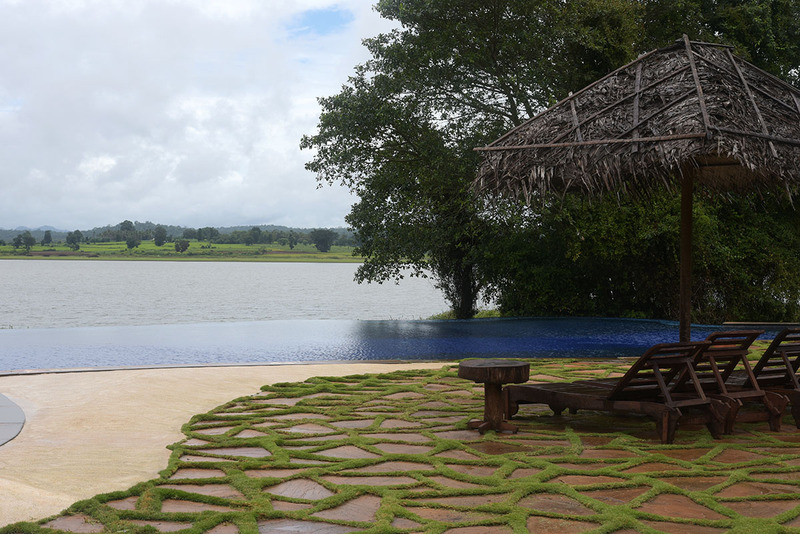 An exquisite place to visit Madhu – loved the quiet and serene feel to the place. Very special indeed. Made all the more atmospheric by the rain Mary. Thank you for your lovely comment. Have a fabulous day! I could not have enough of those pictures and words too. Lovely treat, Madhu. A luxury accommodation marketed as a hut, while in my case a hut marketed as a chalet! 😀 Despite the gloomy skies, your stay at this lodge seems to be quite worth the journey. And there are those animals that you managed to see — just marvelous! Oh Madhu this sounds so idyllic, and the resort is so beautiful. I want to jump on a plane and go there right now. Or better yet wait ’til the dry season when wildlife abounds. Beautiful enticing photographs. Hope you do! Would love to meet you! 🙂 Thank you very much Alison. We leave for Portugal in a few hours! Whoohoo! Have a great time! 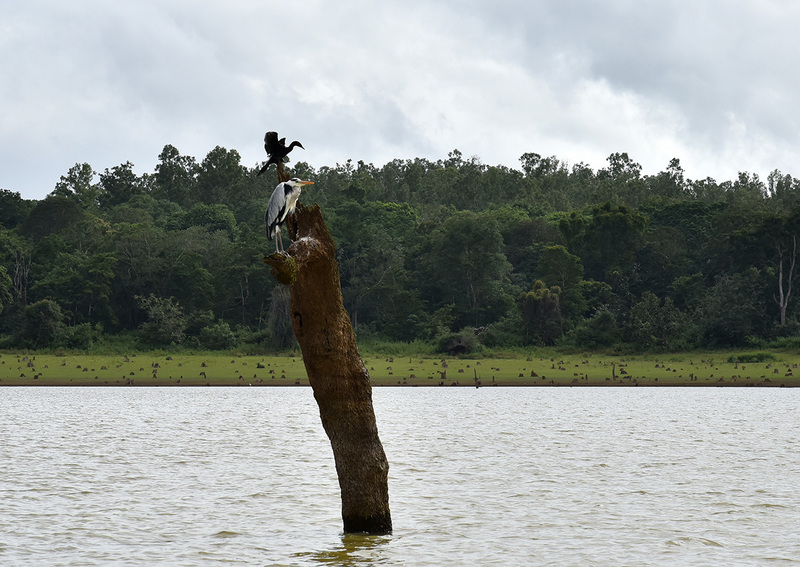 Kabini has been on my travel list for a long time and thanks to you I actually got to see this beautiful place and some its its amazing dwellers. I can’t wait to go there myself. Would this be a good time to spot leopards there? I heard that Kabini is famous for leopards. The drier months between Feb to April might be better. There’s plenty of water now and the foliage is too dense for proper sightings. Oh my goodness, that reptile!! This place seems so stunning and cozy, Madhu! Thanks a bunch for the awesome review and inspiring me to go there soon! Thank you for reading Agnes. Hope you do get to visit Hampi someday. Between boat safari and Vehicle safari which one is more enjoyable and has better oppotunities? We plan to go there in December and can do 3 safaris. 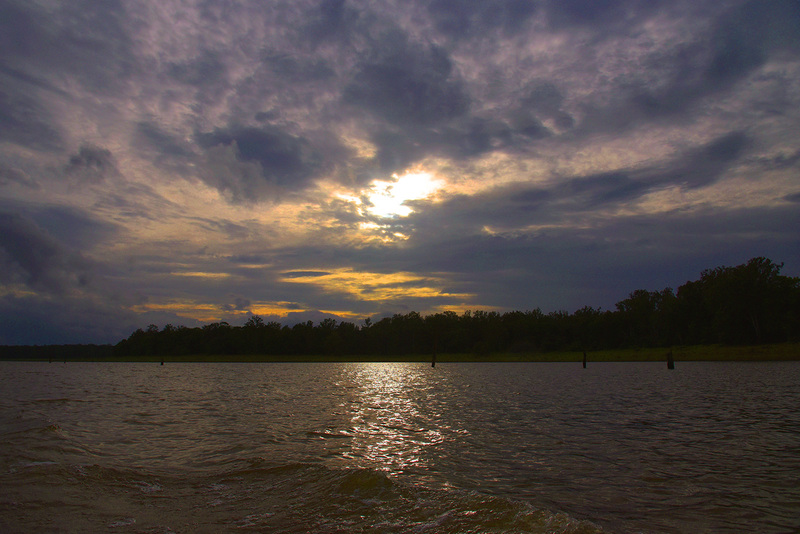 Thinking of 2 evening vehicle safaris and one morning boat safari. As the morning mist may add beauty to the river. Please do let me know your suggestion.